This Forever Manchester monthly Podcast contains all the latest features, news and information from the world of Forever Manchester. 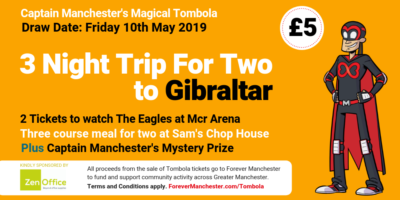 Details of the winners of the August draw of Captain Manchester’s Magical Tombola and information of more amazing prizes in the September draw. News of the latest funding opportunities for community groups at Forever Manchester. A warm welcome to some new members to the Forever Manchester family. The Forever Manchester Update is presented by Terry Snowden and Rosie Strickleton. If you enjoyed this podcast, please check out our Podcast Page featuring a wide range of features, interviews and much more.